Better animal health often gives better profitability, said Professor Henk Hogeveen of Wageningen University of The Netherlands. He pointed out that farmers often underestimate the cost of diseases and the fact that preventive costs are much lower than failure costs. Professor Hogeveen was speaking on Animal Health from an Economic Perspective at a conference at the IDF World Dairy Summit 2018 in Daejeon, Korea on 18 October. 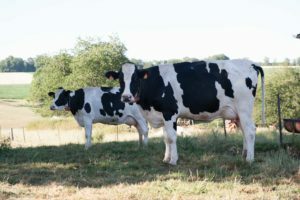 “There are opportunities to increase animal health and profitability through economics and optimal decision-making, which weighs the benefits of less disease against the costs of prevention,” said Professor Hogeveen. “The optimal decision-making is not per definition profit maximization. 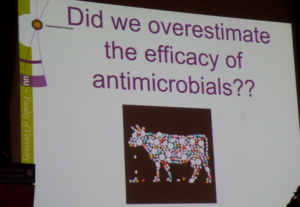 There is difficulty in cost estimations of cattle diseases, thus cost-benefit analysis is important in determining cost-effectivity,” he explained. Dr Tine van Werwen of the University of Utrecht in The Netherlands, another speaker at the conference, said healthy farming is possible with less use of antimicrobials. Citing the case of The Netherlands, Dr van Werwen said her country saw more than 60% reduction in antimicrobial use across all animal species within a decade. The study also found associated reduction in antimicrobial resistance (AMR) in animal commensals. “The proactive action of the Dutch dairy industry in reducing antimicrobial usage saw a reduction of dry cow treatment by 49% and reduction of mastitis tubes by 40%, with no increase in clinical mastitis,” said Dr van Werwen. She said farmers and vets need to be convinced on the need to reduce the use of antimicrobials and consider the impact of antimicrobial resistance. Dr van Werwen said a task force on antimicrobial resistance set up and supported by the Dutch government in 2008 has been instrumental in the overall reduction in antimicrobial use in the country through prudent usage. 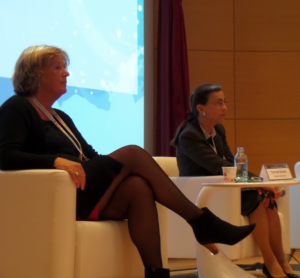 Dr Tine van Werven (left) and Dr Elisabeth Erlacher-Vindel in a panel discussion. The success of the initiative, Dr van Werwen said, was also due to the cooperation of the Dutch dairy industry in changing the attitudes of farmers and veterinarians towards antimicrobial use in animals. “Without being forced by legislation, we would never have accomplished these results,” Dr van Werwen concluded. Dr Elisabeth Erlacher-Vindel of the World Organisation for Animal Health (OIE) outlined the organization’s strategy on AMR and the prudent use of antimicrobials in animals. This includes monitoring the use of antimicrobials in animals and encourage implementation of international standards and guidelines. She stressed the need to build and maintain a database to collect information on the use of antimicrobial agents in food-producing and companion animals, with associated analysis and annual reporting. 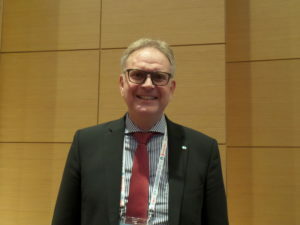 Dr Erlacher-Vindel said efforts must be made to guide and support research into alternatives to antibiotics to encourage the development and uptake of new tools, products and methodologies. In addition, she said governments need support to develop and modernize legislation governing the manufacture, marketing authorization, importation and distribution, and use of veterinary products.